Gift Ideas Box offers you amazing collection of gifting ideas for all occasions. We offer you meaningful gift ideas for him and for her, thank you gift ideas, romantic gift ideas, valentine gift ideas, christmas gifts ideas, birthday gift ideas, baby shower gift ideas - you will find gift ideas for all occasions and for everyone. To show your gratitude and appreciation to your loved ones give the perfect gift - every time! Having a sister is one of the best gifts of life. No matter what you do or how far you are from your sister, she will always be there for you. 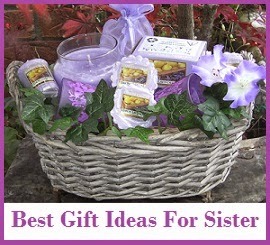 It is great to pamper your sister now and again and on special occasions while giving her a special gift. Here are some amazing gifts ideas for sister. Read on to find the perfect gifts for Sister. 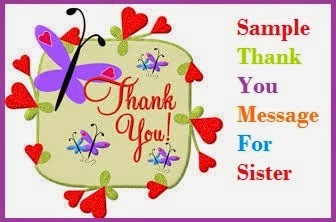 For a heartfelt message to your sister do check our collection on sample thank you messages for sister. Massage Therapy Gift Certificates: A massage has so many health benefits and it is great to consider it as a gift for your sister. Drop in to your nearest spa and you can buy one. It is a gift of wellness to pamper your sister. Stress Relief Gift Kit: Consider buying lotions, oils and creams for stress relief. It will greatly relieve your sister from stress and will refresh her after a tired day’s work. Thank You Gift Basket: A gift basket with tea bags, cookies and spices can be another great thank you gift for a loving sister. Fresh Fruits and Chocolates: If you are having a sister who loves to eat and his health conscious , buy her a basket with her favourite fruits and sugar free -chocolates. She will love it! Spa Products: All women would love to use spa products and your sister will be no exception. Get her a bag of her favourite spa products. Baked Goodies: If you are good at baking, surprise your sister with some baked goodies. Try something unique as red velvet cup cakes with cheese topping. This will be extremely colourful and you could make one without much effort. Hair Accessories: If your happen to have a sister with long hair, try headbands, hair clips, hair chains and other accessories that could make her look beautiful. It might be a simple gift, but can turn out to be a thoughtful gift. Scented Candles: Floral, berry and soy wax scented candles in amber glass would help her to unwind after a long day at work. Thank you gifts like candles can do wonders. Homemade Food: If you are good at cooking, consider giving her a lunch or dinner with her favourite dishes and pack it with love. Who would know her better than her own siblings? Additionally, you could spend time with your sister over meal. Jewellery Box: Another elegant thank you gift can be a Jewellery box to store all her keepsakes and precious jewellery. Engrave your special message and she would treasure it for many more years. Don’t forget to write your special thank you message to your sister even if it is a thank you gift. Add your note and your message such as “To Janice, You are such a wonderful sister and thank you for helping me. Love XXXX.” Thank your sister with thoughtful gifts and tell her how much she means to you.